Tech World: Online diagrams, flow charts, network diagram etc. 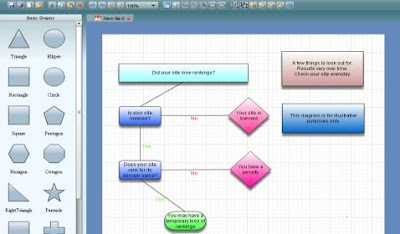 Online diagrams, flow charts, network diagram etc. Whenever creating any presentation, writing any specs doc or creating any technical doc you always need flow diagrams, flow charts, network diagram etc. I mostly use word to design all these as I don't have a Visio license. I am really happy to see a new online diagram creating web site Best4C. Its created in flash and is really cool. You can design a lots of things from flow charts, network diagram, shaped.. to home design, office layout and even road maps. The best part is that it is an online tool. I really hate to install utility software for every small need, so I always prefer some online solution for these problems. Find free windows controls here. Thanks this info was really helpful! I used Lucidchart's network diagrams online and it was really easy to understand. If you use diagrams often you should check it out! I think the best solution is to look for some professional graphic designer tool. But if you want to save your time, try http://charts.poweredtemplate.com/powerpoint-diagrams-charts/index.html, there are a lot of charts and diagrams you can use. The Nike Dunk is an all-time classic model, but it’s legendary status hasn’t prevented it from experimentation. Moden amenities, new lebron 13 technologies, and bold colorways have all nike free 5.0 found their way atop the Nike fitflop shoes Dunk High in recent years, but Nike Roshe Run none have been as bold as michael kors outlet online this new “Psychedelic” release. This graphic Nike free Run heavy, reflective rainbow infused aesthetic looks Nike Shoes more ready for a Grateful Dead Nike Outlet concert than skating thanks to a mbt shoes sale trippy array of multi-color infused swirls, kd 8 alternating black panels and just the fitflops sale right touch of gold throughout. Be Nike Store sure to check out more photos nike basketball shoes 2016 of the latest trippy Nike Dunk Jordan shoes release after the break and if fitflops sandals you’re a fan of the look, Nike Roshe Run know that shops like Premier have kd shoes this pair in stock for $120 Nike Air Max USD. How do you top a live concert from Radiohead's Colin Greenwood? If you're Dries Van Noten, you create the kind of collection for Fall 2014 with red bottom shoes christian louboutin designs so graphic and dynamic, they get people talking just as much as a bass serenade.Clearly giuseppe shoes taking a note from Pantone with a show punctuated (and opened) with Radiant Orchid accents, the jimmy choo outlet label embraced more than just one hue with its floral fantasy. Jarring contrasts paired blue with christian louboutin shoes maroon (and orange, too! ), yellow with fuchsia, and optical illusion spirals with just about everything. Dizzying? louboutin sale No. A collection that got our wheels spinning? Absolutely.